Hi, Lois here with a clean and simple card today. Clean and simple cards are not my usual style, but every once in a while I go outside my comfort zone. Today is one of those days. 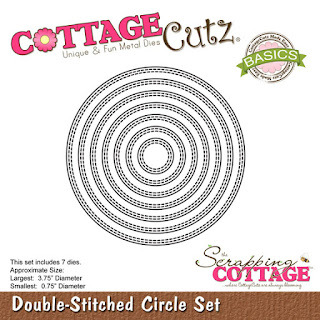 CottageCutz has a new line of Expressions Plus dies, which are very nice, script words. My CAS card today has one of them. 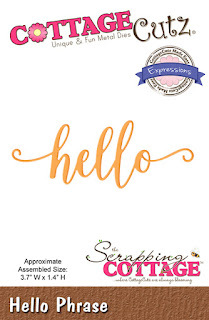 Heavyweight white cardstock 8 1/2" x 5 1/2", scored at 4 1/4"
Janet, our video artist, has created a video showcasing many of the Expressions Plus word dies. I cut and scored my heavyweight white cardstock and centered the mask piece slightly below center. This mask was actually the negative piece left from when I had cut a circle for a previous card. I anchored it with a couple of Post-It notes and then sponged on the Tumbled Glass ink using a sponge dauber. Using the same sponge dauber, I added some areas of Salty Ocean ink to give some depth to the water area. As you can see in the photo, after inking up the dauber I sponged off a bit of the color onto the Post-It note. Better to have to add color to the circle area than to try to remove it! Then I cut my fish and sentiment from the scraps of orange and blue cardstock. Once again using the sponge daubers, I added some texture to the two fish around their fins and gills. Using the fine-tip glue applicator, I carefully added glue to the back of the sentiment. Similarly, I added glue to the back of the blue fish. I also adhered a small foam pop-dot on the back one of the fins. 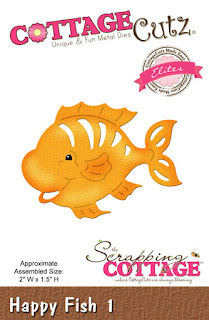 I repeated the process on the orange fish and adhered both of the fish and the sentiment to the card. I added a few drops of glue to make the bubbles coming from their mouths and drew in their eyes with a black marker. This close up shows how the fins with the foam dots stand out from the card. Here again is my card, which I thoroughly enjoyed creating! I would invite you to step outside your comfort zone and create a different kind of card today. Love the fish!! The colors are so bright and happy! Great card Lois!! Lois, your card is gorgeous with the water scene and cute fish! CAS or not, it is a gorgeous card, Lois! A very pretty card!!! The whole concept is very nice. nice card! I like the circle background for the fishes.